A condylar fracture being repaired in the surgery pit at Palm Beach Equine Clinic. Recent advances in imaging, surgical talent, and the facilities necessary to quickly diagnose, treat, repair, and rehabilitate horses with condylar fractures mean such injuries are no longer considered career-ending. Most commonly seen in Thoroughbred racehorses and occasionally polo ponies, a condylar fracture once meant retirement for a horse. But now, thanks to imaging, surgical talent, and improved facilities, the odds are in favor of a full recovery with horses regularly returning to competition in their respective disciplines. What is a Condylar Fracture? A condylar fracture is a repetitive strain injury that results in a fracture to the cannon bone above the fetlock due to large loads transmitted over the cannon bone during high-speed exercise. On a radiograph, a condylar fracture appears as a crack that goes laterally up the cannon from the fetlock joint and out the side of the bone, essentially breaking off a corner of the cannon bone, sometimes up to six inches long. Condylar fractures are further categorized into incomplete and non-displaced (the bone fragment hasn’t broken away from the cannon bone and is still in its original position), or complete and displaced (the fragment has moved away from the cannon bone itself and can often be visible under the skin). Additionally, condylar fractures can occur laterally or medially. According to fellow surgeon Dr Weston Davis, most condylar fractures tend to be lateral on the outside condyle (a rounded projection on a bone, usually for articulation with another bone similar to a knuckle or joint). The first step in effectively treating a condylar fracture through surgery is to accurately and quickly identify the problem. Once the injury is identified as a condylar fracture, surgeons step in to repair the fracture and start the horse on the road to recovery. Depending on surgeon preference, condylar fracture repairs can be performed with the horse under general anesthesia, or while standing under local anesthesia. During either process, surgical leg screws are used to reconnect the fractured condyle with the cannon bone. 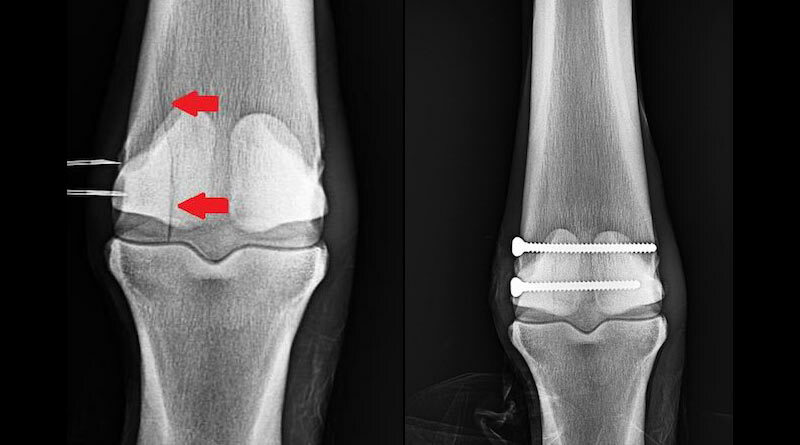 The scan image at left shows a condylar fracture of the right leg. At right shows the screws inserted during surgery. This patient, a Thoroughbred racehorse, walked away from surgery comfortably and is recovering well. More complicated fractures, or fractures that are fully displaced, may require more screws to align the parts of the bone. For the most severe cases of condylar fractures, a locking compression plate with screws is used to stabilize and repair the bone. PBEC surgeon Dr Jorge Gomez, approaches a simpler non-displaced condylar fracture while the horse is standing, which helps to aid in a faster recovery and more successful surgical outcome. According to Gomez, the recovery time required after a standing condylar fracture repair is only 90 days. This is made even easier thanks to a surgery pit installed at the clinic. The four-and-a-half-foot recessed area allows doctors to perform surgeries on anything from a horse’s hock and below from a standing position. Horses can forgo the risks of general anesthesia for a mild sedative and local nerve blocks, greatly improving outcomes. “A condylar fracture was once considered the death of racehorses, and as time and science progressed, it was considered career-ending,” Brusie said.